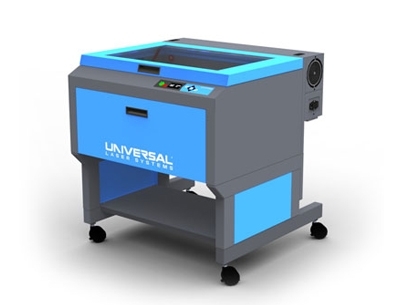 Universal’s Professional Series of CO2 laser systems provide an unbeatable combination of high power (up to 150 watts using dual lasers), three platform sizes and an advanced, materials-based print driver that delivers consistently excellent cutting and engraving results. The Professional Series is ideal for high speed cutting jobs; deep high-throughput engraving; and fast, permanent marking. Maximum Part Size 29" x 23" x 9" 37" x 23" x 9" 37" x 23" x 9"
Dimensions 36" x 39" x 36" 44" x 39" x 36" 44" x 39" x 36"
Compatible with Windows XP/Vista/7 - 32/64 bit.